This is a What Can You Do With This from around Halloween. The new at blogging thing has afforded me a chance to put some old material up. I live in a half fancy – half normal city, Saratoga Springs NY. The fancy side of the town gives me opportunities to see some things that most people do not. For instance, there is a garish house villa (zillow puts it at $5.8 million) that decorates for holidays. They had a contest for the person who could guess the weight of the pumpkin, and the winner received a year membership at the local YMCA. Sitting on top of the pumpkin is a pint of chocolate milk from Stewarts (go easy now… I was thirsty and I happen to be 5 years old). Fast forward to Applied Math class. 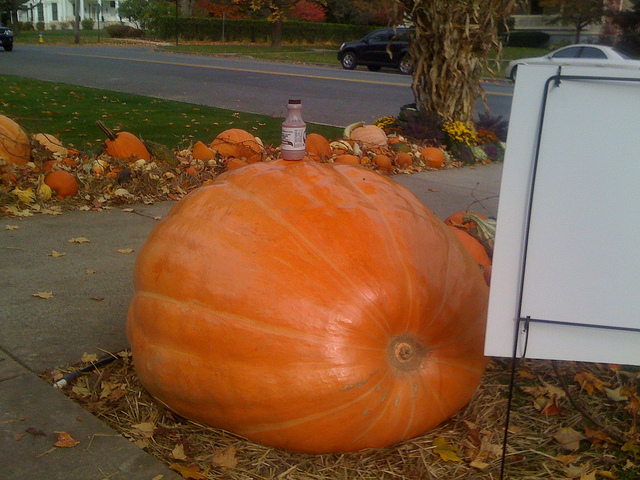 We took a high resolution image and tried to work through how much the pumpkin would weigh. They worked out that they needed another pumpkin to make a comparison, and so from underneath my mathemagician cape, I pulled out a small pumpkin that would be easy to find the weight and volume. I have made the mistake in this class of leading them on too much, and while they enjoy the activity, I don’t think they get as much out of it. Since this was the fall, I don’t remember the nitty-gritty details, but most of the groups had calculated that the weight was somewhere near 1000 pounds, and the real weight ended up being around 800 pounds. The different groups used different methods to find the volume by the picture, and surprisingly the most accurate weight estimates were the groups that used a sphere to model the volume. Next year I plan to make this a weeks worth of material, I’ll take more pictures, open up the competition to anyone in school (and if I’m bright I’ll put in on this blog in real time), and announce the answer online.